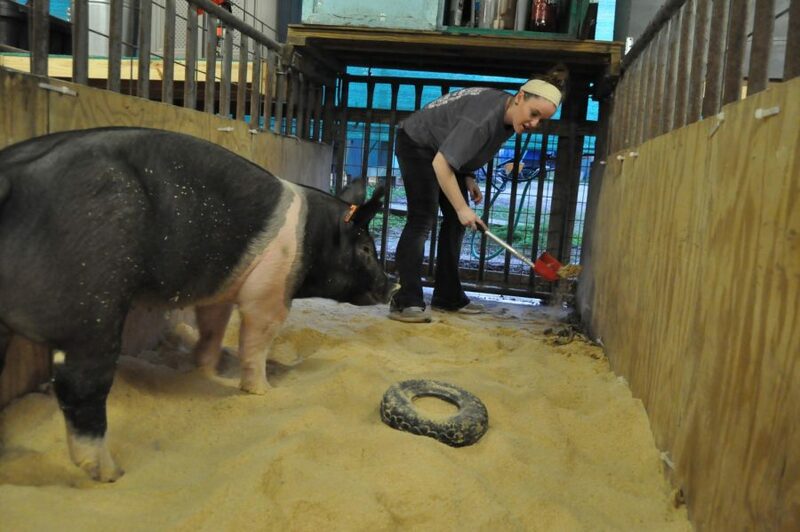 Senior Lauren Kocian cleans out her pig Ellie May's cage. She works with her animals before and after school. The broom strokes echo rhythmically through the FFA barns as Ellie May works on her new victim. Her black snout sniffs around before choosing a pair of black and white Adidas. Senior Lauren Kocian wasn’t surprised because 20 pairs of shoes have already fallen victim to her 240-pound pig’s appetite. It’s easy to find Kocian, who is in a faded t-shirt and jeans, at the FFA barns. Someone’s always greeting her or seeking her help. For two hours a day Kocian hurries between three of the four FFA barns. She’s either feeding, cleaning or walking her pig or running her lamb. Like a shadow, her turkey usually follows Kocian. 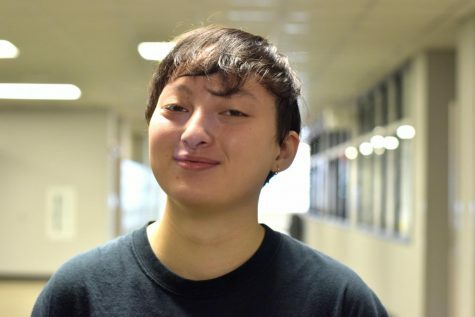 “I just kind of learned I can’t waste my time, so I always have to be moving,” Kocian said. The routine is nothing new. Kocian has been around animals and barns her whole life. Her father has been an agriculture teacher for more than 40 years. She has followed him and her grandfather around barns, shows and to visit breeders since she was old enough to walk. Her family and agriculture teacher are hoping for the best in the coming weeks as she prepares to show her animals at the Humble Rodeo and Houston Livestock Show and Rodeo. “I’m hoping that she makes the auctions at both shows so that she can end her show career on top,” Lauren’s agriculture teacher Kevin McCarty said. Her lamb Jax jumps up on his pen in excitement whenever he sees her nearby. Jax is Kocian’s Houston Livestock Show and Rodeo lamb as well as her “pride and joy.” Jax requires the most attention, receiving about an hour and a half of Kocian’s time per day. Kocian got Jax a week after he was weaned off his mother in June. She got him from breeder Stewart Spurill, whom she used to visit every summer in Stephenville when her dad got his sheep. She usually doesn’t show sheep, but she decided to try raising one as a senior. With an electric razor in one hand and a sheep’s neck in the other, Kocian helps other students wrestle with their sheep to eventually sheer their heads for show. Despite all the walking and feeding being done to prepare animals for show, their looks are essential as well. “Shows are like the prom of agriculture,” Kocian said. The Humble Livestock show will be Kocian’s last show with her pig and turkey. She will walk around the ring guiding her pig Ellie May with a whip and showing off her body. As for the turkey, Kocian will hold Uno by the feet as the judges examine him. Hundreds of hours go into preparing for those key show moments. Kocian has four extra weeks with Jax. The Houston Livestock show will be their final show. She’ll walk Jax in without a lead, just her hands underneath his neck and behind his ear. Then she’ll walk him by the judge before they walk in a circle. Finally, she’ll make him drive, pushing all his muscles and legs back so that the judge can feel how much meat he has on him. Kocian is not just a student who takes care of her animals. She also is the girls soccer team manager, a position she accepted after suffering four concussions and then having to quit the sport. Even with her three animals, she still makes time to go on the soccer trips and do the stat sheets. She even educates the soccer players on agriculture facts. While the soccer team teases her about talking too much about FFA, her agriculture counterparts kiddingly pick at her navigation skills and how loud she gets. “Lauren is funny, very energetic, kind of loud at times, but one of the hardest-working, most dedicated, committed kids I’ve ever been around,” McCarty said. “We were at (the) state convention and we were in the Ag truck. She was riding in the front seat next to me, you know, over there in the passenger side. Well, whoever’s in that spot is the navigator; and, yep, Lauren got us lost. More than once. As the final shows near, Kocian will miss seeing Jax across the barn waiting for her, hearing Ellie May’s dog-like bark and even Uno following her around everywhere. She has to prepare to say goodbye to the animals she has spent so many hours with over the past few months. Her high school career may be coming to an end, but her impact on Kingwood Park’s FFA program will last for years.